thinking about improvements I wonder if anybody has installed a proper cutter rig (where inner and outer forestay are parallel, maybe permanently in use, maybe with additional backstays). Curious and happy to hear about possible solutions. I need new rig and sails, and have been thinking about the same, so i hope someone with knowledge will chip in here! Will definitely follow this post! you can see in the image which I added to my initial post how I think that could be solved. attached to the chainlocker-bulkhead. My idea is not to improve the sailing abilities but mainly to avoid heavy weather-excursions to the foredeck (to maybe fix a stay and a hanked storm sail). Would have enjoyed this on a trip form Norway back home and force 7 to 8 in the second night near Helgoland). I think that would match for my needs the disadvantage of rolling the genoa before tacking. 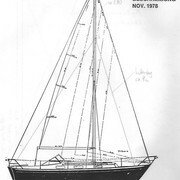 The running Backstays could secure the mast backwards. Maybe there is a fault in thinking this way. Therefore I´d be happy to receive any comment on this. If you are not going to sail her as a cutter, maybe a removable Solent stay would be easier, and better? I am thinking that the foretriangle might be a little small for a jib and a staysail, as a proper cutter rig. But I am no sail maker or rigger! 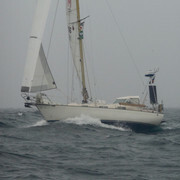 I am going for Hank on sails anyway for my new rig, as she will be a passage maker/world cruiser only. My girlfriend has a beautiful waquies 32 that does the major part of our cruising around the neighborhood. Will keep following this post, and will let you know when I start talking to riggers and sail makers in a couple of months! I thank you for the fotos! Good viable sail wardrobe on your inner stay. Regarding to Selden mast you can mount your cutter 5-6% down from the top without any backstays. My cutter is connected to ordinary forestayplace. 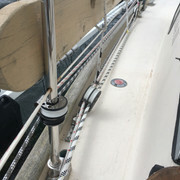 I've connected my genua about 75-76 cm in front of the forestay on my bowsprit. This construction have I used for thousands NM. with the time I get used to the thought of installing maybe an extended pulpit like you did. I think there is no way of buying such a thing. Where/how did you made yours? Has it any influence on weather helm? Here it is my two furlex rollers. The new is a furlex 200S with 7mm wire the old one is now for the cutter. I’ve also have a new mainsail because the old one blowed to pieces in a gale F8 in the North Sea outside Lista. It’s four full battens all sliders are rolling sliders as on the battens. The reefs are deeper than ordinary. The secondary reef is as an ordinary 3’rd reef. very nice arrangement of rollerfurlers and new main with nicely rounded leech! 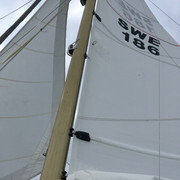 ORUST - when you moved the headsail fuller forward 75 cm, what about the sheeting ? Did you move you car setup for the gene or does it still fit ? 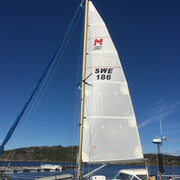 Or modify the headsail ? I’ve mounted a short track for the sheetblock in front of the old one.perhaps you can see it on the picture. I’ve also modified the headsail with a high cut.It is now approximately 26-27 square meters. thanks a lot , that answers my questions and confirms what I thought I have to do. 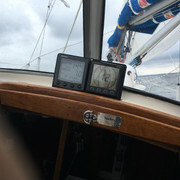 More about cutter sailing with my Monsun. First reef, deeper than standard and approximately 12 square meter cutter jib.